Wow. It’s been a busy few days, which means that I haven’t been able to get onto the blog much lately, so I apologise for not replying to comments here and there. Unfortunately it’s going to be just as busy a week this week, with another trip down to Sydney in the works. This time however, it’s not work-related; I’m heading down there to attend a lecture by Neil Gaiman… can you say “excited”? I certainly can. However, not to worry; I have some posts set up to publish while I’m away, so they should hopefully tide you over for a while. In the meantime, I thought I would drop a quick post today, discussing The New Frontiers. I first heard The New Frontiers when I was exposed to their song, “Black Lungs“, a while ago… however, for whatever reason it languished in my “possible blog material” playlist for months, until now. I’m really not sure why I didn’t post the tune back then, as it really is a cracking song. It’s fitting that I post it now, however, as The New Frontiers have just released their debut album, Mending , this week. 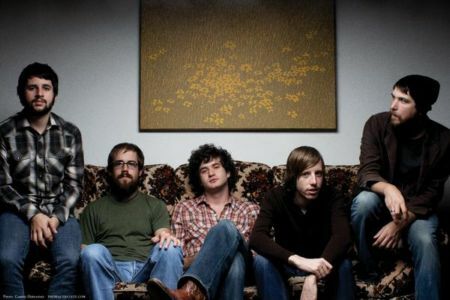 The New Frontiers have been drawing comparisons from music bloggers to Wilco and Ryan Adams left and right, wherever you look. And, while I think these comparisons are somewhat overstated, you can certainly pick up those influences in their music. To that mix, however, I would add a healthy dose of The Alternate Routes… personally, I feel that would be a more accurate parallel, if you’re one of those people who demands their new music is compared to something. The plain fact is that “Mending” is, in it’s entirety, one of the most promising albums I’ve heard from the alt.country stable thus far in 2008. There’s an integrity to these songs that eschews the pretentitiousness that the oh-so-hip alt.country sometimes spawns. And that’s a great thing. I’ve included two songs below, the sparse “The Day You Fell Apart”, with it’s beautiful velvet vocals, and then the aforementioned “Black Lungs”; a meatier song, but one that still conveys the emotive quality of lead singer Nathan Pettijohn’s voice. Apart from those, however, I would suggest heading across to their myspace page, as there are several links there that point towards sites where you can stream the entire “Mending” album. Next Post Malcolm Middleton… easily my favourite Scot.